Aside from pipe and drum and Highland dance competitions, the games are renowned for their unique heavy events. 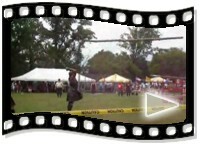 By far the most recognizable trademark of the games is the spectacular caber toss. The origins of this event are unknown, although it may have developed as a sport among foresters, who would compete amongst themselves by throwing tree trunks into nearby rivers. 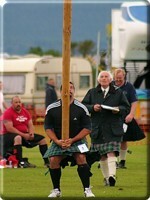 Contrary to popular belief, the caber is thrown not for distance but for style. 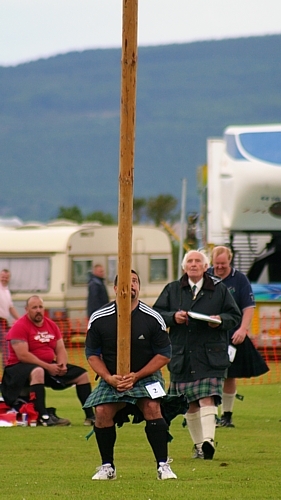 The athlete must rest the caber against his shoulder and lift it vertically up off the ground while keeping it perfectly balanced. His objective is then to toss it in such a way that it turns end over end in the air and lands with the lower end pointing towards the athlete in a relative twelve o'clock position.